"Portland, Oregon ... Belgian Blocks"
Click image to enlarge "Belgian Block", Basalt Cobblestone Quarry, Ridgefield NWR, Washington. Image taken September 23, 2011. 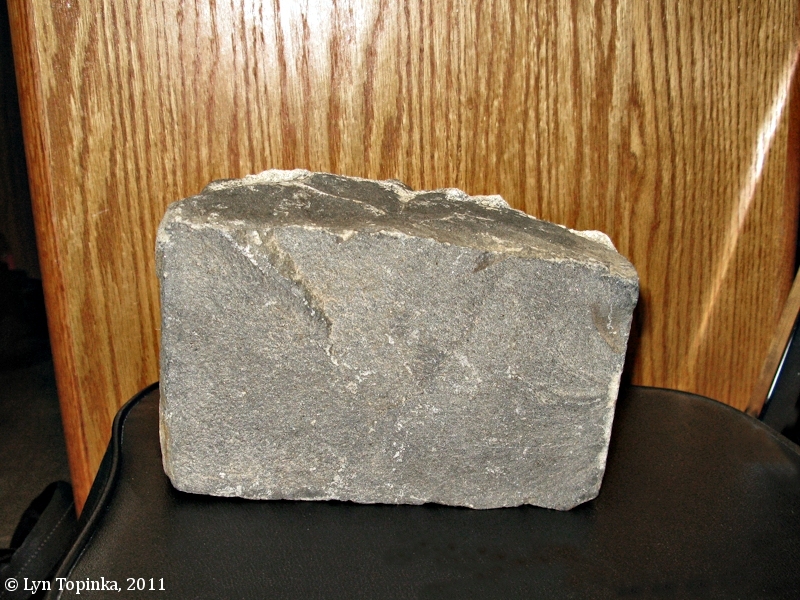 Belgian blocks, introduced to New York about 1850, were so named because they were first used in Brussels, Belgium. Belgian blocks are of a unique shape - narrower at the top than at the base - rather than of a stone type or source location. Fitted together, the blocks made for sturdy roads. Beginning in 1885, Belgian blocks made of basalt mined at St. Helens, Oregon, and then at Ridgefield, Washington, were used on the heavily traveled streets in Portland, Oregon. Parts of Front, First and Second streets were paved with the locally-mined blocks while the granite brought in as ship ballast was used in the crosswalks (see Harvey Scott, 1890, below). Today, if construction unearths these Belgian blocks the City of Portland is saving them, cleaning them, and then re-using them in historical projects. According to Harvy Scott (1890, "History of Portland") and other researchers, the Belgian blocks used in the roads in Portland, Oregon, were made from locally mined basalt from quarries in St. Helens, Oregon, Ridgefield, Washington, and some mines in the Columbia River Gorge. The basalt was NOT transported here as ship's ballast. However the granite brought in as ship ballast WAS used in Portland crosswalks. This differs from the Belgian blocks used in the roads in Tacoma, Washington, nearly 150 miles north of Portland. According to Peter Callaghan ("Tacoma News Tribune", April 13, 2011), Tacoma's cobblestones were "repurposed granite ballast from ships returning from England or sandstone blocks cut from the mine in Wilkeson". The basalt mined in the St. Helens and Ridgefield quarries are made of the Grande Ronde basalt of the Columbia River Basalts. The Columbia River Basalt flows are massive fissure lava flows which covered much of Idaho, Washington State, and Oregon between 17 and 5.5 million years ago. Approximately 300 thick sequences were erupted from north-south fissures near the present-day Washington-Idaho border. They ranged from 10 to over 100 feet in thickness. Twenty-one flows poured through the Columbia River Gorge forming layers of rock up to 2,000 feet thick. According to a 1983 report which sampled 285 blocks, the average block depth was 4.6 inches, average width was 3.9 inches, and average length was 6.2 inches. An 1890 report mentioned a larger size - "brick-shaped pieces, some 4x10x15 inches". 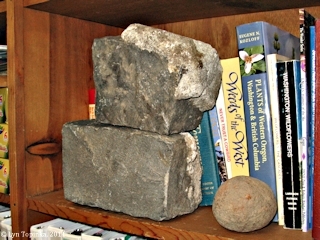 Click image to enlarge "Belgian Blocks", Basalt Cobblestone Quarry, Ridgefield NWR, Washington. Image taken September 23, 2011. Quarries in the Oregon community of St. Helens were an early source for Belgian blocks. The Basalt Cobblestone Quarries District (also known as 45-CL-113H), is located on the Carty Unit of the Ridgefield National Wildlife Refuge, and was added to the National Register of Historic Places on December 14, 1981 (District #81000587). Between approximately 1880 and 1910 basalt chunks were quarried at seven different locations and then barged up Lake River to Portland, Oregon, where they were chipped into paving stones known as "Belgian blocks". Parts of Front, First and Second streets were paved with Belgian blocks between 1880 and 1885. Today, if construction unearths these Belgian blocks the City of Portland is saving them, cleaning them, and then re-using them in historical projects. The June 17, 1880 "Vancouver Independent" mentions a quarry for Belgian blocks located "above Fisher's Landing". "Phil. Thornton went up the river on Monday with a gang of nine men to quarry stone for the Belgian pavements of Portland. He has bought the old Hicks place above Fisher's Landing, which has plenty of rock on it, and having a sub-contract from a Portland street contractor will make the chips fly during the summer." The U.S. Bureau of Land Management's General Land Office (GLO) Records database lists John Hicks being granted title to 161.37 acres of T1N R3E, Section 4, on September 1, 1865 (1850 Oregon-Donation Act), 3.25 acres of T2N R3E, Section 33, on September 15, 1866 (1820 Sale-Cash Entry), and 160 acres of T2N R3E, Section 33, on May 2, 1870 (1862 Homestead EntryOriginal). This property is located on the northwest side of Prune Hill. In 1911 James McBain opened a rock quarry on the Simon Sabot property, Klickitat County, Washington. Known as the "McBain Stone Quarry", the quarry's specialty was Belgian blocks. After McBain's untimely death in 1912, the quarry was operated by the Pacific Bridge Company of Portland. The Quarry was located near Wright (today's Klickitat) along the Klickitat River. Simeon Sabot Farm Near Lyle Is Envy of Realty Men. German Who Has Lived Hustling Life Says He Does Not Care to Sell Land Which Was Once Abandoned by Settler. "LYLE, Wash., Dec. 10. -- (Special.) -- Born in Germany in 1855. Excused from the country's army service owing to the support of a large family devolving upon him. Apprenticed early in life to learn the blacksmith trade. At the age of 33 years landing from a crowded ship at Annapolis, Maryland. 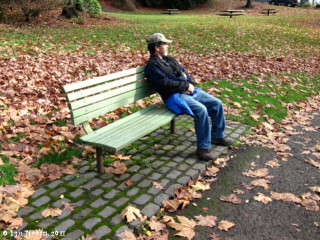 Such was the early life of Simeon Sabot. Sabot was poor and honest and industrious. In looking for work he was not particular and to his class of immigrants the United States always has a welcome. Sabot worked to the West and at no time was he without work and a home. The "Sam" Shockley homestead, near Wright's Station, was for sale and had been inspected by a number of Portland real estate men, but they all turned it down. It was for the blacksmith with some hard-earned accumulation to be the purchaser at Mr. Shockley's own price. Simeon, as he is best known, about one year ago paid over the cash and took possession. After building a more comfortable home and other improvements, Simeon figured in the property investment $3500. He could see nothing but an ideal place for a home and farming. Simeon Sabot's bachelor home was somewhat disturbed when there appeared at the door the knock of James McBain, a marble dealer and contractor of Hood River. Contractor McBain wanted to negotiate a 25 years' lease. Particularly on that portion where stood the upright columns or pillars of rock near the river at the base of the mountain, which settlers know by the Indian name "Sah-ha-le La-mon-la." A lease for five years was agreed upon. Soon blasting was heard and near a score of Belgium cutters were at work. Then followed a quarry siding and at the same time appeared overhead cables from the quarry to the floor of the unloaded car. The transfer is made quickly with little handling of the blocks. The average size of the blocks is six by six inches. The journeyman receive 2 1/2 cents for each pave cut and some of the workmen draw an average of $7 a day. For the last few months there has been a daily shipment of a carload of the paves to Portland. "It is a desirable basalt, free from the grizzly state and it polishes as smooth as glass, and while not a marble, it is very similar to the product of Aberdeen, Scotland." When reminded that it would be convenient to draw down a rental from $5 to $10 a day, Simeon Sabot expressed his displeasure at the hoard of real estate men who are after him. Mr. Sabot has been offered $5000 for his fruit and garden land and $10,000 for the quarry. He says he likes the Klickitat climate and has no desire to sell at those prices. The quarry adds much to the industrial advance of Lyle and Klickitat Valley. It not only increases railroad revenues, but aids farmers and others. Contractor McBain estimates he will market 4,000,000 pave blocks in 1912. If his plans carry, more than $100,000 will be expended in labor." Source: "Morning Oregonian", December 11, 1911, Historic Oregon Newspapers Archives, University of Oregon Libraries, 2017. 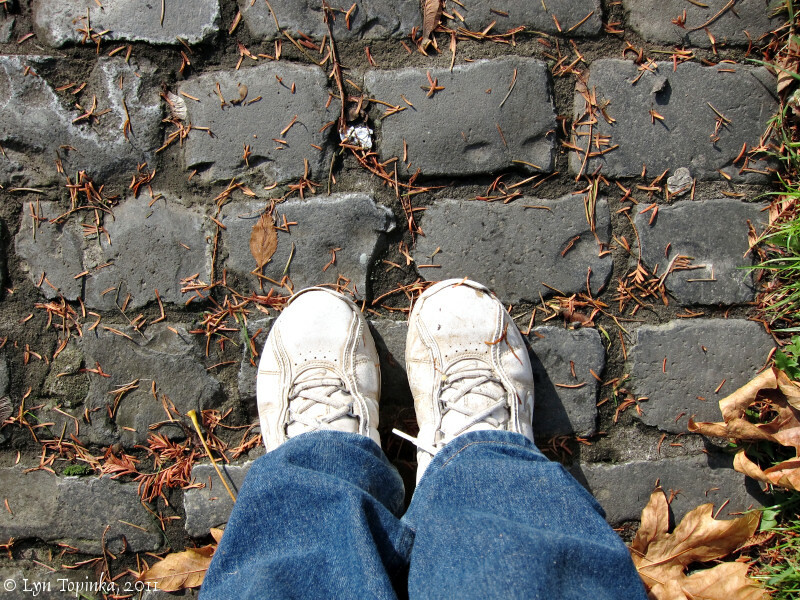 In 1975 the City of Portland passed an ordinance which calls for the preservation of any cobblestones excavated during construction and maintence activities on city streets. The cobblestones are warehoused by the City and are meant to be reused in appropriate civic historic restoration projects. The City of Portland re-uses the early Belgian Blocks which once paved streets in the downtown area. One location the blocks are found is in Cathedral Park, under the St. Johns Bridge, in St. Johns, Oregon. 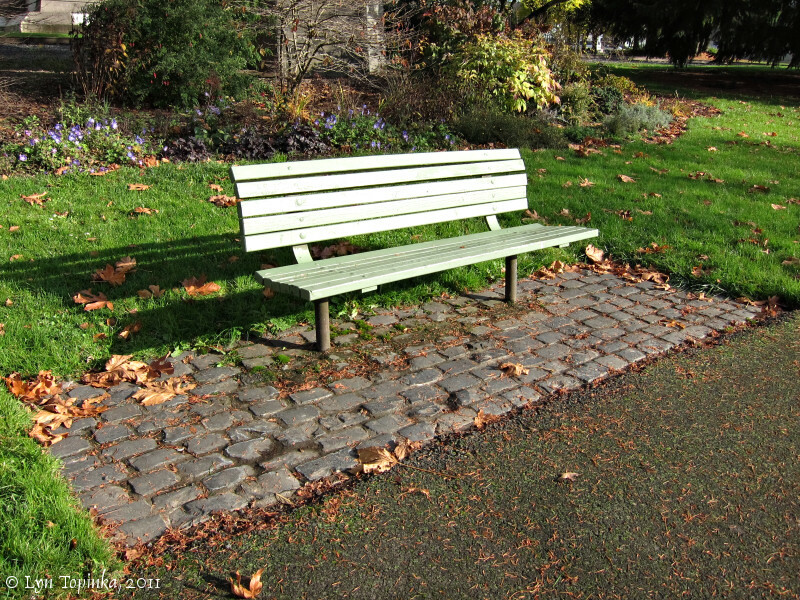 Click image to enlarge Belgian blocks underneath park bench, Cathedral Park, St. Johns, Oregon. Image taken November 28, 2011. Click image to enlarge Campus Map with Belgian Blocks, Lewis & Clark College, Portland, Oregon. Image taken August 24, 2014. 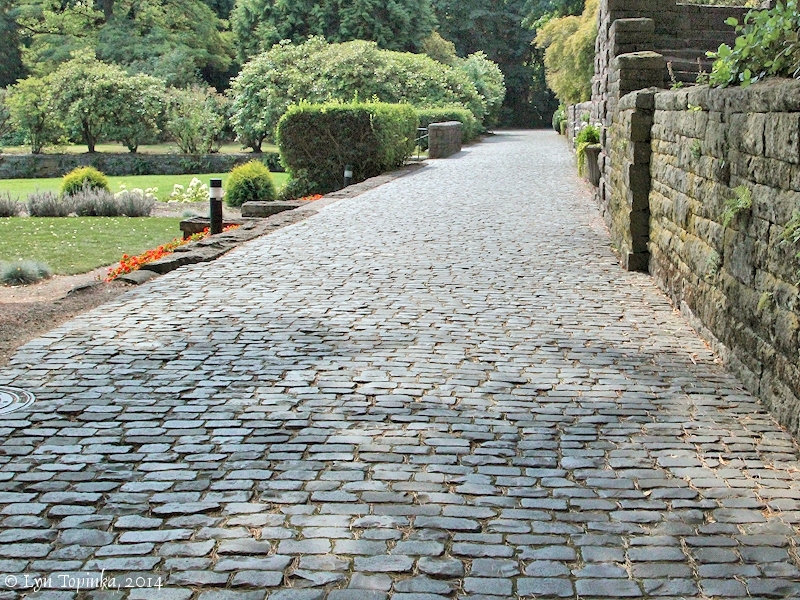 Click image to enlarge Formal Garden road with Belgian Blocks, Lewis & Clark College, Portland, Oregon. Image taken August 24, 2014. Click image to enlarge Parking circle with Belgian Blocks, Lewis & Clark College, Portland, Oregon. Image taken August 24, 2014. Cross-walks of the streets are of plank or slabs of stone, the latter a foot or more in breadth by some four or five feet in length, laid treble. Many of them are granite, brought from England or China in ships as ballast, being most cheaply obtained in that manner. In 1885 there were fifty-two and one-half miles of improved streets - thirty miles macadamized, three Belgian blocks, three and one-fourth planks, sixteen and one-fourth graded only." p. 437 ... "Passing from Couch's and Stark's tracts to Lownsdale's one reaches the region of retail houses, banks, offices, halls, hotels and churches. The streets are paved with Belgian block, basaltic stones cut in brick shape, making a durable roadway, but as the weather surfaces grown smooth, very severe on horses, sometimes giving them heavy falls." p. 446 ... "In 1876 the flood was particularly high, and stood for weeks. It was deemed useless to trifle any longer, and the grade was raised to a point above danger, and the streets paved with Belgian blocks." Source: Harvey Scott, 1890, History of Portland, Mason & Co., Portland. "Seven basalt cobblestone rock quarries lie on the floodplain of the Columbia River approximately two miles north of Ridgefield, Washington. The floodplain here exhibits a rolling topography, characterized by basalt knolls surrounded by low areas of alluvia silt which are seasonally flooded. The quarries are located in the sides of these knolls, and a rock road of the same material connects the quarries with Lake River. The only visible remains of the quarry operations are the quarries and their associated piles of tailings, and the two sections of rock haul road. The walls of several of the quarries have fallen in, and they are overgrown with trees and brush. The Columbia River basalt outcroppings, which are Miocene to Pliocene in age, provide moderate relief ranging from zero to 40 feet. Thus, most of the knolls rise well above the high water line. The knolls are covered with Oregon white oak savannah, while willow and other emergent and submergent marsh plants grow in the alluvial areas. A narrow belt of Oregon ash defines the high water line in some areas. Douglas fir grows on the highest ground at the eastern edge of the area. Refuge management objectives on this unit are to preserve the natural Columbia River floodplain and to provide habitat for migrating waterfowl. The only active management within the nominated area is limited summer grazing by cattle. The area was probably being grazed at the time the quarries were in operation, since other parts of the unit have been farmed for over 100 years. Except for a limited amount of fencing and some jeep trails, the land retains its natural character. Public use of the Carty Unit is generally limted to wildlife observation, hiking, fishing and berry picking. A self-guiding interpretive trail lies on the east end of the unit, partially within the nominated area and passing by one of the quarry sites. The area along the trail and around the south end of the nominated district is used extensively by school groups for environmental education. 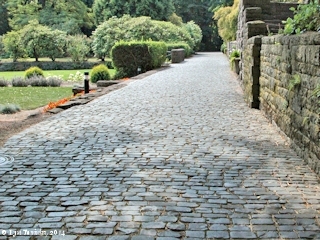 The Basalt Cobblestone Quarries represent a significant technological period in the development of Portland, Oregon and other American cities, and a turn of the century industry in Ridgefield, Washington. As Portland grew from a frontier village into an urban and commercial center in the second half of the Nineteenth Century, some sort of street improvements quickly became imperative. The rainy winter climate of Portland turned dirt streets into impassable muddy quagmires, while in summer the streets dried out into dust bowls. Several different materials, including wooden planks and macadam, were used in the search for a satisfactory paving material that could withstand the extremes of Portland's climate. 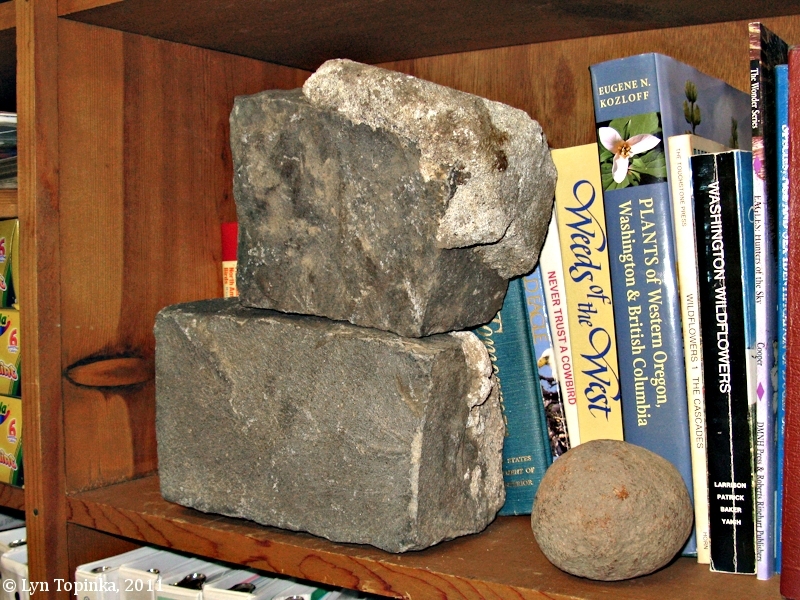 Beginning about 1880, basalt blocks were quarried near Ridgefield and barged upriver to Portland for use as paving material. 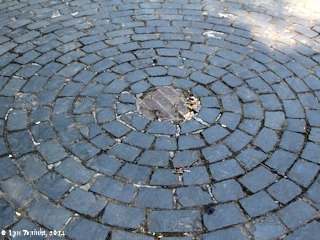 The basalt was chipped into brick-shaped pieces of a standard size, called Belgian block, and laid on the streets. Sewer blocks were also cut from the quarries. 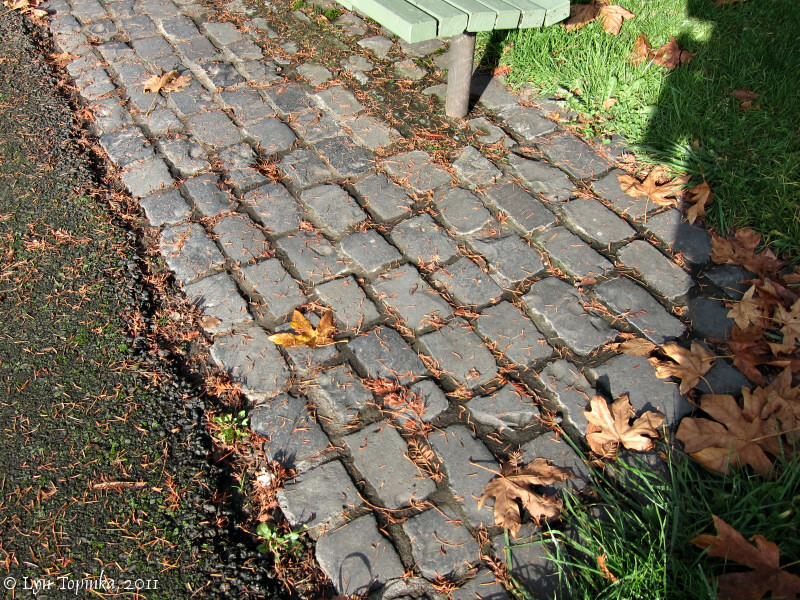 By 1885, three miles of Portland's streets were paved with Belgian block (1) and eventually the paving may have covered as much as 30 miles of streets (2) before its use was discontinued. 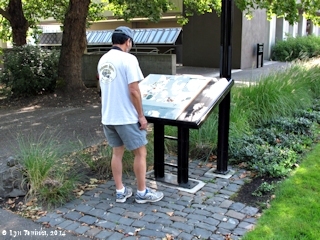 It was used in both east and west Portland. The stone was hard, and when it was evenly laid it made a firm - and noisy - street. Constant use created problems, however, because the corners of the blocks wore down. They formed a cobblestone surface that was slippery when wet and water froze in the joints during cold weather. Horses pulling heavy loads could not get traction on the slick surface. The unfirm ground on which the blocks were laid caused the paving to warp, and the constant lifting of the blocks for sewer and water line repairs (Portland doesn't have alleyways for utilities) and the installation of street car tracks also contributed toward an uneven surface. 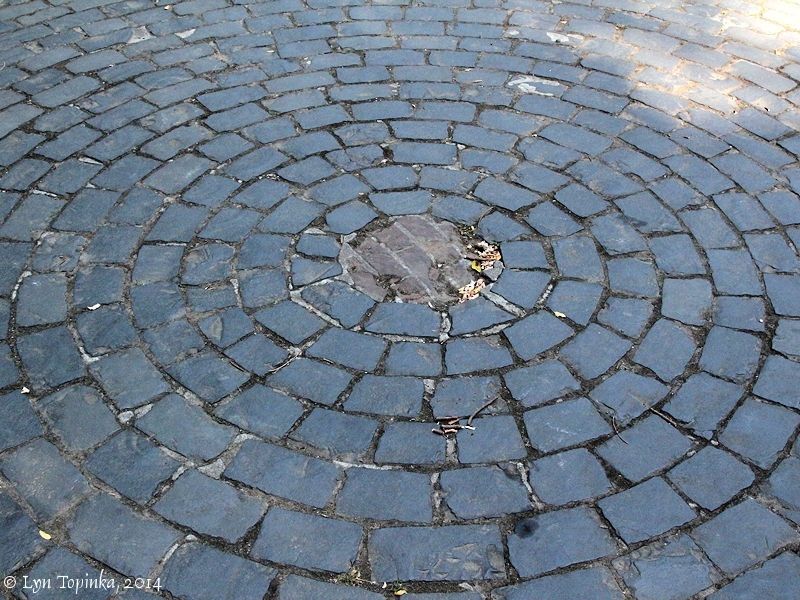 The Belgian block paving eventually proved as unsatisfactory as the other paving materials in use at the time. Much of the cobblestone, or Belgian block, is still intact under the streets of Portland, having been covered over with asphalt. A survey by the city engineer's office estimates that there could be as much as 4.8 million square feet of the stones (3). While most of the stones came from the Ridgefield quarries, the crosswalks were originally ships' ballast. Crosswalks of the streets were made of slabs of granite a foot wide and four to five feet long, laid treble. The granite was brought from England or China in ships as ballast (4). On the return trip, the ballast was replaced by cargo from the Pacific Northwest. This explains the presence of Chloris radiata, a hardy, tropical grass native to Jamaica, in Portland. It is unknown anywhere else in Oregon, but it can be found in Portland pushing up through the asphalt that covers the old cobblestones (5). Apparently the grass seed was on a cargo from a tropical port and became attached to the ballast, which then was used for street paving. Portland City Ordinance No.139670, passed by the City Council in 1975, calls for the preservation of cobblestones excavated during construction and maintence activities on city streets. The cobblestones are warehoused by the City and are meant to be reused in appropriate civic historic restoration projects. In 1977, the City estimated it had 60,000 cleaned stones and 200,000 uncleaned stones on hand (6). 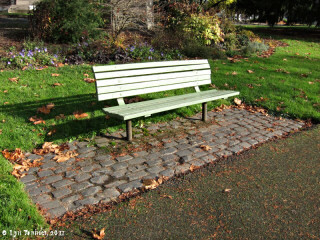 The stones have been reused in a number of park projects including a short path in Washington Park, curbs along the Rose City Golf Course, fill in around street tree plantings, and under benches in Pettygrove Park. Work book pages in the possession of the McKie family indicate that the quarries were still in operation in April 1903, and the oral family history states that the contract expired in 1909 (10). Although the local significance of the quarries was short-lived, they played a significant role in the economic and cultural growth of Nineteenth Century Portland and Ridgefield. Since Portland was not the only American city searching for a satisfactory paving material for its streets during the Nineteenth Century, on a national level the quarries represent an important technological experiment in the evolution of American cities." (1)	H.W. Scott, History of Portland, Oregon, (Syracuse, N.Y. 1890), p.206. (2)	The Sunday Oregonian, 19 May 1974. (3)	Oregon Journal, 15 July 1974. (5)	The Sunday Oregonian, 19 May 1974. (6)	Doug Bridges, memorandum to Bob Gustafson, (City of Portland, Oregon: Bureau to Planning), 15 June 1977. (10)	Mrs. Allan McKie, letter to James E. Carty, 28 May 1975. Source: Steven E. Thomsen, Bureau of Street & Structural Engineering, 1983, Report on Belgian Block Paving, City of Portland, Oregon, April 1983, and taken from the National Register of Historic Places, Inventory -- Nomination Form, "Archaeological Survey of Lower Lake River and Bachelor Island Slough, Clark County, Washington", September 1975, and "Cultural Resources Assessment of the Carty Unit, Ridgefield National Wildlife Refuge, Clark County, Washington. ", October 1980. 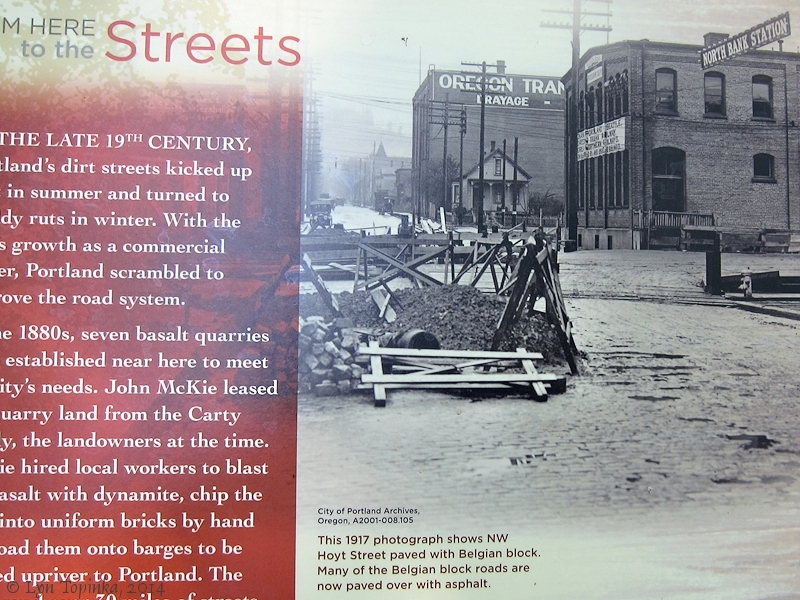 "IN THE LATE 19th CENTURY, Portland's dirt streets kicked up dust in summer and turned to muddy ruts in winter. With the city's growth as a commercial center, Portland scrambled to improve the road system. In the 1880s, seven basalt quarries were established near here to meet the city's needs. John McKie leased the quarry land from the Carty family, the landowners at the time. 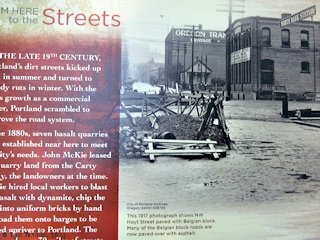 McKie hired local workers to blast the basalt with dynamite, chip the rock into uniform bricks by hand and load them onto barges to be floated upriver to Portland. The city paved over 30 miles of streets with the blocks. The quarries were abandoned in 1909 as newer road building techniques came into fashion." Source: Information Sign, Ridgefield National Wildlife Refuge, Carty Unit, Ridgefield, Washington, 2014. 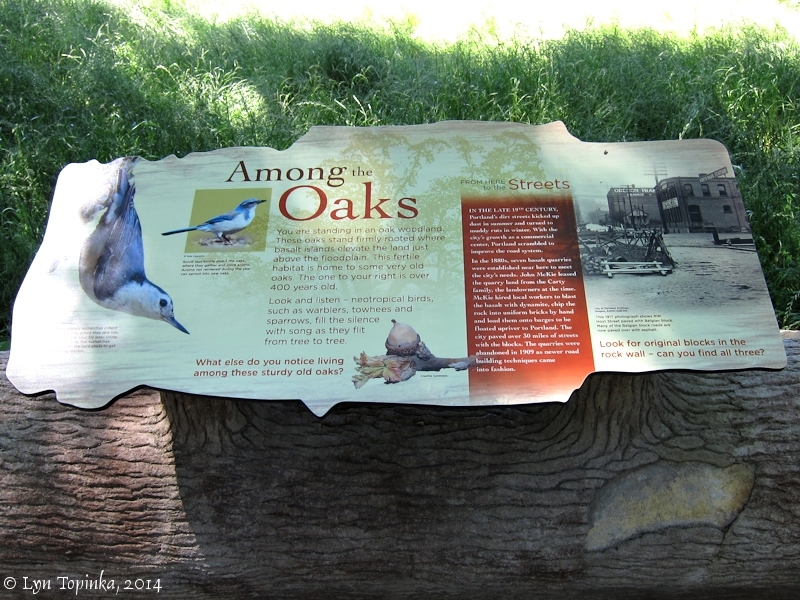 Click image to enlarge Basalt Quarries and Portland Streets information sign, Ridgefield NWR, Carty Unit, Washington. Image taken May 30, 2014. 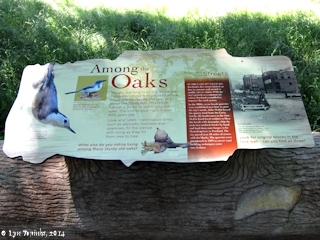 Click image to enlarge Detail, Basalt Quarries and Portland Streets information sign, Ridgefield NWR, Carty Unit, Washington. Image taken May 30, 2014. Historic photo is 1917 photograph showing NW Hoyt Street paved with Belgian block. "Belgian block pavement will be given a trial on Portland streets." "It is probably that Belgian block pavement will be used on Front street." "Belgian block pavement is being laid on First street in front of Union Block." "S.S. Cook has been awarded the contract for laying Belgian block pavement on Front street, from Ash to Madison, at $2.17 per square yard, and has furnished bonds for the faithful performance of the contract." "Macadamized streets in Portland are a fraud. Let us have no more of them. They are not adapted to the climate. In the Winter season they are stretches of slop and mud, and in the Summer are beds of dust. It is time the Common Council should stop this style of street improvement." "There is an awful lot of Belgian blocks still un-hauled at Riley's quarry." "Saturday a scow came down for the Belgian blocks, a sufficiency of which had been got out to fill the contract." "Splendid weather for making gardens, hauling Belgian blocks and doing carpenter work." "J.W. Dodson talks of moving down from Sauvie's Island, and driving his team to haul Belgian Blocks." "The city has sixty-nine miles of improved streets, three miles of which are paved with Belgian stone block pavement, thirty-seven miles macadamized and nearly five miles planked. The stone block pavement is on Front, First and Second streets, where the bulk of the heavy teaming is done. There are one hundred and twenty miles of sidewalk, and twenty-three miles of sewers." "William Strachan has a contract for getting out 300,000 Belgian blocks for street-paving purposes. The contract comes from E.J. Jeffery, of Portland. It will furnished employment for fifteen or twenty men for about a year." "The Oregonian's leading editorial last Sunday on street paving, after having dealt with the subject extensively, declares that "the only pavement fit to lay direct on the earth, or in a bed of sand, is Belgian block, and that is much better laid in concrete. These are principles established by experience. Any departure is sure to be a mistake." It will be remembered that the only pavement that has stood the test in Portland is the Belgian blocks from the St. Helens quarries." "The growing popularity of brick pavement is noticeable everywhere. The time is not far distant when it will supercede all other pavements. To Oregon City belongs the honor of introducing this pavement to Oregon and no cause has been felt as to the success of the venture. On this subject the New York Tribune publishes the following: The vitrified brick is taking the place of the Belgian block in street paving in a number of cities. Cincinnati, Chattanooga, Macon, Augusta and other northern and western cities are already using the vetrified brick with great success, and the demand for that sort of pavement is so large that the manufacturers are millions of bricks behind in their orders. The brick is made of a low grade of fire clay, is almost as hard as flint and is impervious to moisture." "Of all the forms of street improvement tried in our city there is but one that has given absolute and unqualified satisfaction, and this is the solid stone blocks of Front and other streets. They were placed in miserable fashion, have been torn up for gas and water mains and the street has otherwise been badly treated, yet it is in very fair condition, and were the blocks reset the street would be the best, or one of the best, in the city. All this with the heaviest and most constant sort of travel. Asphalt, if of the best grade, makes a fine street for lighter travel, but stone blocks must be used next to car rails, else it will not stand. For our residence and suburban streets, our native blue basaltic rock, in the form of macadam, answers almost every requirement, but we don't use enough of it. We improve a street with gravel or macadam; teams dislodge a certain amount of this, which finds its way into the gutters, where it is allowed to remain, forming pools of water in the center and on the sides of the street to keep it moist and assist in its destruction. If these macadam streets were well crowned and kept well crowned; if the spots that are today small pools were made, by the addition of macadam so that they would no longer hold water; if the gutters were opened up that the water might find its way into the answers, we would have fine streets, despite our wet climate. This blue basaltic rock is fine road material, and we have it at our very doors. We should use more of it, however, and use it conscientiously. "THE PORTLAND RAILWAY COMPANY. The year just closed witnessed the laying of the first 7-inch girder rails in Portland. These were laid on a heavy concrete base, with Belgian block pavements grouted in with cement. The first piece of track of this description was laid by the Portland Railway Company on Burnside street, from First to Fifth, and consisted of a double track, connecting the tracks on First street with those on Fifth. The 40-pound tee rails on the Washington street track, between Third and Fourth and between Sixteenth and Twenty-second, were taken up, and the 7-inch girder rails, weighing 91 pounds to the yard, were substituted. This track was also laid on heavy concrete base, with Belgian block pavement, grouted with cement. The length of track laid on Burnside and Washington streets was about one and one-half miles." "WILL QUARRY BELGIAN BLOCKS, ST. HELENS, Or. "Feb.27. -- (Special.) The letting of the contract for 640,000 Belgian blocks for paving the streets of the metropolis will be considerable help to the business of this community, as the blocks are to be quarried here, necessitating the employment of a large number of men whose wages run from $2.60 to $8 per day. Two quarries will be operated. One on Milton Creek, and the other below town, known as the Listers' quarry. The latter has several feet of loose rock over the quarry and this will be barged to Portland, crushed and used on the city's streets." "The Sister's quarry below St. Helens is being run full blast. The rubble is shipped by barges to Portland and other points for street improvement. Jack McKie has a large contract for Belgian blocks. There is no finer rock in the world than that taken from the St. Helens quarries for street pavements." "Jack McKie has finished his Fort Stevens contract and is now filling a contract of 450 tons of rock for the Vancouver barracks, which will be shipped from the Sister's quarry by barge. He has also a contract for 150,000 Belgian blocks for the City and Suburban railway of Portland." "Ownership of the street railway franchise on First street between Madison and Coumbia streets has been found to be vested in the Portland Consolidated Railway company ... The street has recently been improved with Belgian block pavement on that portion not occupied by the railway tracks, but the company and the owners of the franchise refused to lay the blocks on that portion of the street that they should improve. ... The Portland Consiolidated Railway company will be requested to lay the Belgian block pavement between Madison and Columbia streets, and if it refuses street car traffic on that thoroughfare will be stopped by the city." "After an investigation consuming several weeks in time, during which all the different methods and materials used in street paving were carefully considered, the city authorities of Portland have unanimously decided in favor of Belgian blocks to be used on all streets where heavy traffic is expected. The awarding to Jeffrey and Bufton of one of the largest single contracts for street paving in the history of Portland is an event which will result in incalculable benefit to St. Helens and Columbia County. This community, possessing as it does, by far the largest supply of basaltic rock suitable for the manufacture of Belgian blocks in the State and of easy access will find through the decision of the Portland authorities, a ready market for an immense amount of this stone in the shape of Belgian blocks and crushed rock which is used in making the concrete foundation on which the blocks rest. This contract, for which Philip Bros. of this city will furnish the blocks, will require 950,000 blocks. Laid down in Portland these blocks are worth $44 per thousand or a total of $41,800, which will be disbursed in this community in the following proportions: labor, which is by far the largest beneficiary, will receive in round figures, $33,250, leaving a balance of approximately $8,550 for the stone and transportation. Figuring on a basis of two hundred blocks per day per man, which is a fair average, this means 4,750 days work, or 95 days steady employment for 50 skilled mechanics at good wages, beside the small army of laborers, teamsters, blacksmiths and others necessary in handling a contract of this magnitude. Stone men are jubilant over the decision of the Portland officials and predict a bright future for the St. Helens stone market. It is believed that the awarding of this contract on Friday the 25th of this month, will lead to other and larger ones in the near future; in fact it is confidently expected that a similar contract will be let during the fall or early winter months, and the prestige that has been attained by St. Helens stone, leaves but little doubt that this stone will be specified by the Portland officials." "It is with pleasure we congratulate St. Helens on the continued good prospects in the paving block cutting business. The contract recently secured by Philip Bros. for 950,000 blocks to be laid in the 14th street district, around the North Bank Depot in Portland, and another contract of equal size for the same neighborhood filed for publication by the city engineer, will mean great activity in the stone business in this city. These two contracts will bring about seventy thousand dollars into St. Helens and Houlton. It is gratifying to see that the authorities at Portland recognize the superior qualities of stone paved streets for heavy traffic. Both the stone crushing plants are running day and night and this years output will double that of any previous year. Any city that can supply men with steady employment and the good wages that St. Helens does needs no special boosting. Such a condition makes this city a place where industrious men deserve to come and make a home for themselves." Source: "St. Helens Mist", September 1, 1911, courtesy Historic Oregon Newspapers archives, University of Oregon Libraries, 2014. "The Houlton Commercial club is very anxious to interest Oregon communities in the use of Belgian block paving. They have granite quarries that produce the very best grade of blocks for pavement. Belgian block and wood block are both Oregon raw material and the time will come when they will be used a great deal more than at present." Source: "Daily capital journal", March 2, 1912, courtesy Historic Oregon Newspapers archives, University of Oregon Libraries, 2016. COMMERCIAL BODIES SHOULD ADVANCE ITS CLAIM FOR PAVING PREFERMENT. 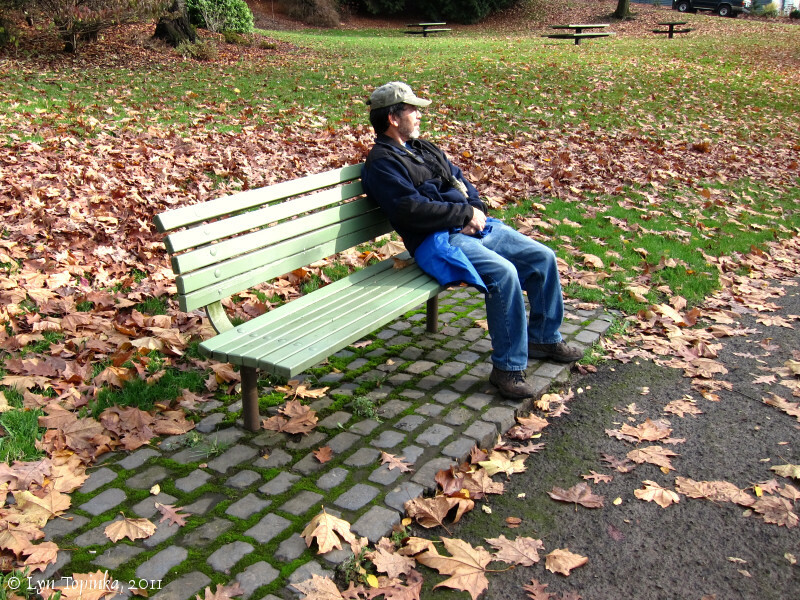 Multnomah Authorities Might Be Induced to Favor Local Product In Their Paving Work. "St. Helens, the home of the Belgian paving block, should forthwith present its claim in a forcible manner to the authorities having in charge of the work of paving the seventy miles of highway in Multnomah county as a prospective, meritorious and deserving candidate as the supply source for a great deal of the material to be consumed in that enormous volume of public work. This claim would not have to be based upon any sentimental assumption, but upon the fact of genuine merit, backed by dollar for dollar value. There is no patent paving material that is in any manner whatever a competitor of the Belgian block in point of durability. A pvaement laid with the idea of carrying heavy traffic, certainly should be laid with no other material. This, of course, is the foremost reason for presenting the cause of the Belgian block to the consideration of the prospective customer. However, its claims for favor are many. In the first place, the Belgian block is strictly a home product. In this respect, also, it has no competitor. And further, too, being a strictly home product, all the expenditures in its employment as a paying material would immediately flow back into the channels of home commercialism. Furthermore, Belgian blocks is the only paving material which has no cost for the raw material. Nature's lavish hand in placing this superior basaltic formation at our disposal has made it possible to utilize it at a comparatively low cost. A Belgian block pavement is the only one that can be guaranteed to stand up under heavy traffic. It makes no difference what other class of paving material is used or by whom it is placed, the consumer cannot expect to have a guarantee of its durabiltiy. No contractor will guarantee patent paving material at all. With the Belgian block no guarantee would be necessary. Its durability has for many years been an undisputed fact. The portion of the highway from the oil tanks, in the vicinity of Linnton, to Portland, is, no doubt, carrying the heaviest traffic of any section of road in the state. Approximately 100 ten-ton auto trucks make the trip daily from the tanks to the city. No ptent paving can long withstand such a severe test. The distance from the oil tanks to the city is approximately two miles. It is proposed to surface that section of the highway to a width of eighteen feet. For that work it would require approximately 900,000 regulation-size Belgian blocks, and even though the first cost of the improvement by the use of stone blocks were greater, the ultimate cost would be nominal, as future cost of repair would be entirely eliminated. Portland has sent into the ocffers of foreign institutions during the last decade hundreds of thousands of dollars for paving material. Vitrified, or Seattle brick has been extensively used for paving the streets of the Oregon metropolis. The money so expended built up foreign institutions at the cost of the home product. The test of times has demonstrated the fallacy of such business methods. The use of the wooden block, another strictly local product, and excelled for standing up under heavy traffic only by the Belgian block, ahas been industriously avoided, greatly to the discredit of the authorities and to the financial loss of the community at large. The merit of the Belgian block should be presented to the Multnomah county authorities in the most convincing manner possible by business interests of this community. Certainly, it does seem that out of the great volume of material to be consumed in paving the 70 miles of Multnomah county roads, such a meritorious local material as Belgian blocks should be given the consideration which is due it." ." We set out early this morning and proceeded along the side of Deer Island [Deer Island]; halted at 10 A. M. near its upper point and breakfasted. here we were joined by three men of the Clan-nah-min-na-mun nation. the upper point of this Island [Deer Island] may be esteemed the lower side or commencement of the Columbian valley. after breakfast we proceeded on and at the distance of 14 miles from our encampment of the last evening [on Deer Island] we passed a large inlet 300 yds in width [Multnomah Channel] this inlet or arm of the river extends itself to the South 10 or 12 M. to the hills on that side of the river and receives the waters of a small creek [Moulton suggest McCarty Creek] which heads with killamucks river [Tillamook River], and that of a bayau which passes out of the Columbia about 20 miles above, the large Island thus formed we call wappetoe island [Sauvie Island] ... on the North side of the columbia a little above the entrance of this inlet [Multnomah Channel] a considerable river [Lewis River] discharges itself. this stream the natives call the Cah-wâh-na-hi-ooks. it is 150 yards wide and at present discharges a large body of water, tho' from the information of the same people it is not navigable but a short distance in consequence of falls and rappids a tribe called the Hul-lu-et-tell reside on this river above it's entr.— at the distance of three miles above the entrance of the inlet [Multnomah Channel] on the N. side behind the lower point of an island [Bachelor Island] we arrived at the village of the Cath-lah-poh-tle wich consists of 14 large wooden houses [Cathlapotle Village, located on the Carty Unit, Ridgefield NWR]. here we arrived at 3 P. M. ... after remaining at this place 2 hours we set out & continued our rout between this island [Bachelor Island] , which we now call Cath-lah-poh-tle after the nation, and the Lard shore. at the distance of 2 miles we encamped in a small prarie on the main shore [Wapato Portage], having traveled 19 miles by estimate. the river rising fast ..."